We often hear of the Sandwich Generation, the people in the age group who care for their aging parents while supporting their own children. Many of us face the challenges of simultaneously caring for our elders and youngsters and are members of this Sandwich Club. What no one ever explained to us is that the sandwich that is referred to is no simple recipe with two slices of bread (e.g. ham & cheese, PB & J, grilled cheese). Rather, it is a multi-layered concoction with a few slices of bread. 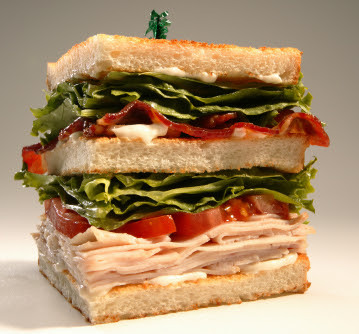 We should really be called the Club Sandwich Generation. The uniqueness of this club sandwich is that each slice is a different type of bread. In particular, the top half of the sandwich, caring for elderly parents, is most reflective of this. Depending on the aging process, individual needs, and character of each parent they each can be represented by very different types of bread. Any skills learned from caring for one parent may not necessarily be transferrable to caring for the other. The emotional, financial, and workforce impact on caregivers can be significant. Twice I have briefly stepped out of the workforce. The first time was to care for my father during an illness and the second to help my mother after his death. My sister is making the major sacrifices for my mother now. These are choices that we have made willingly and lovingly but are still difficult. We also have four siblings that have pitched in but I have seen how difficult it can be for friends who are only children or who have siblings who don’t contribute. The difference in the aging process between each of my parents has been remarkable. I was my Dad’s primary caregiver and he accepted, and ultimately depended on, my care. He recognized the changes associated with aging which, for him, were primarily physical. The time spent caring for him was a tremendous bonding and learning experience. My Dad, who had the greatest sense of humor, enjoyed the moments when we could make light of his failing health. For example, he particularly appreciated my suggestion that we revisit his will while I was giving him a suppository. There are a few points that I believe are universal regardless of the slice of bread each parent represents. Safety is paramount. A constant monitoring and removal of falling hazards or addition of supports such as rails is vital. Financial and legal issues must be proactively and properly addressed. Housing and transportation needs have to be modified, as needed. Caring for the caregivers is incredibly important to help relieve the emotional, physical, and financial toll. Scheduled breaks for the caregivers must be worked in so that they may have planned down time, days off during the week, or vacations. It’s important to get other loved ones to contribute to the caregiving. Some of those that might be expected to help out do not for a variety of reasons: their relationship with the parent is strained; they have significant personal life demands; they simply don’t know how; or, unfortunately, they are lazy or unaware. But, if they cannot provide “hands-on” help there are many other ways in which they can contribute: they can make check-in phone calls on the parent; they can send money or gift certificates; they can have meals delivered; or they can give a gift to the caregivers for their hard work. Ultimately, they do need to step up from time-to-time so the primary caregivers can get away.